The Ibis World Trade Centre Dubai offers 210 air-conditioned rooms, two restaurants and bars and WiFi internet access throughout. 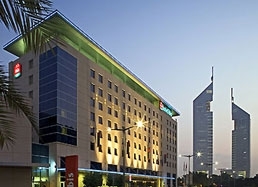 The hotel is directly linked to the International Exhibition Centre and Convention Centre and is located just off Sheikh Zayed Road, only minutes away from the Burj Khalifa, Dubai Mall (free transfers), DIFC and Jumeirah Public Beach and 15 minutes from the Airport. An ideal base for a business or leisure stopover in Dubai.